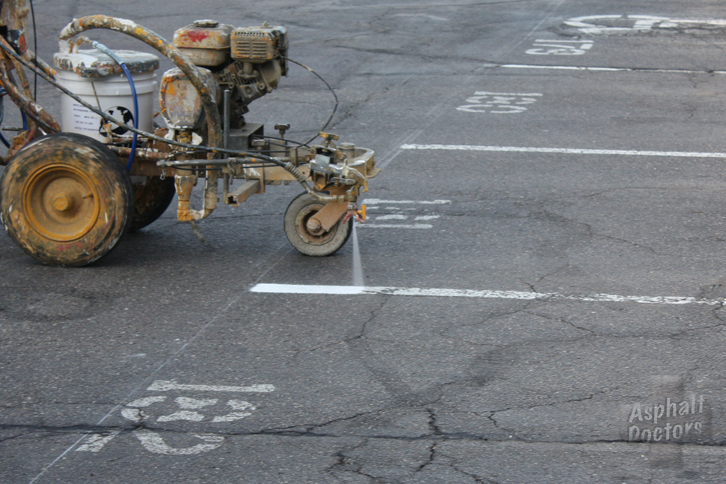 A parking lot is one of the first things noticed by customers, clients, and visitors entering a facility. 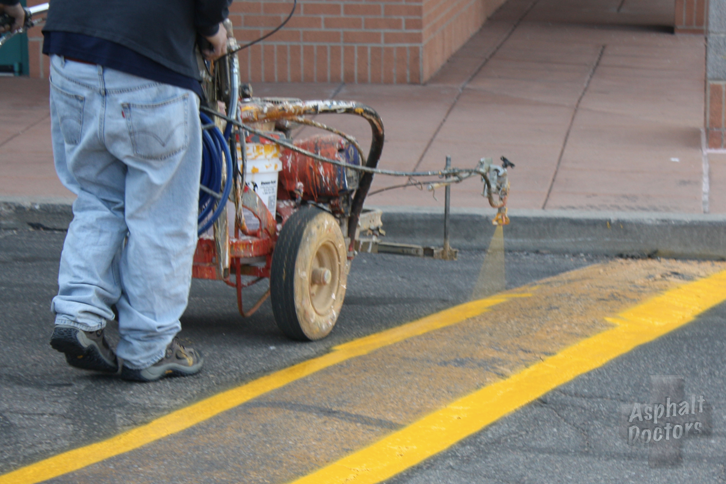 The color contrast of a newly striped lot is attractive and is a good indication that the property owner emphasizes maintenance. A well-marked parking lot directs people safely around the parking area. 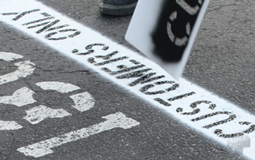 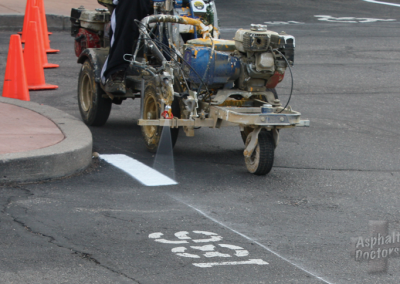 Crosswalks, stop bars, loading-zone markings, and properly marked pickup areas, such as for customers or boarding vehicles, inform pedestrians where they should walk, when to give right-of-way to traffic, and what areas to avoid. 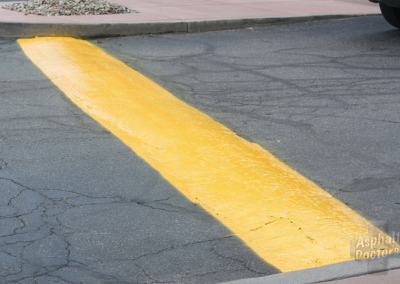 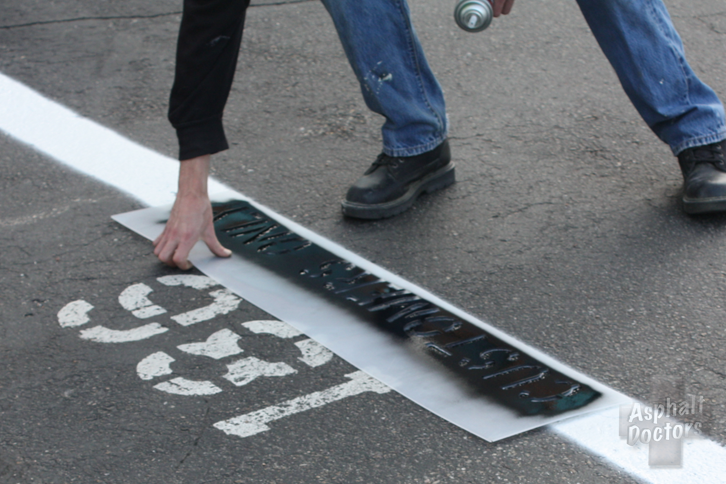 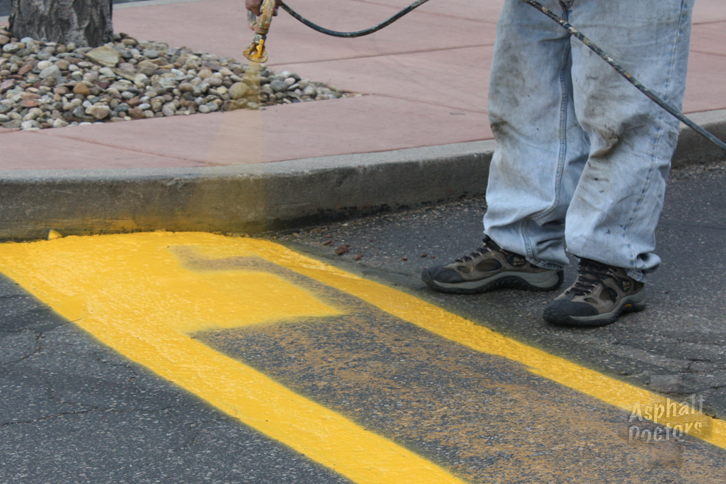 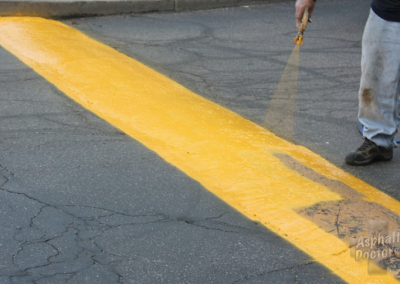 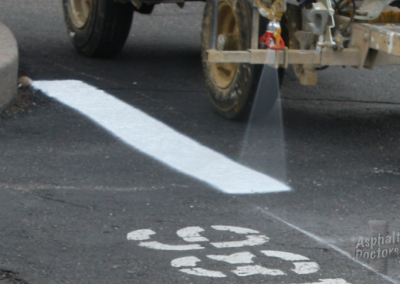 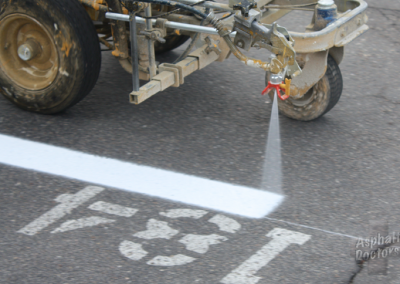 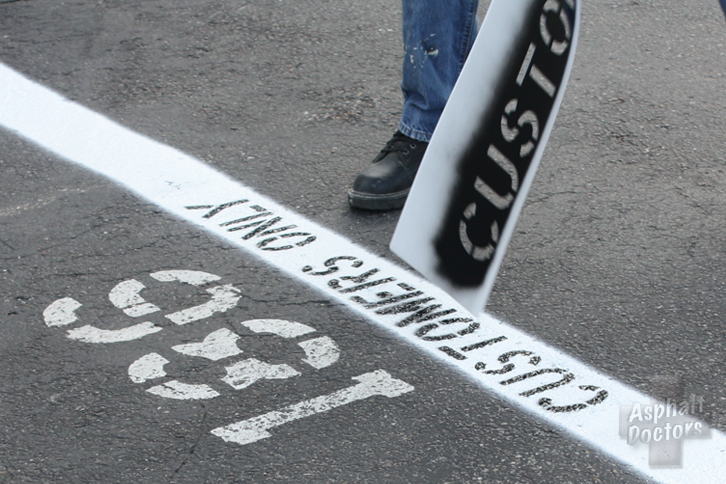 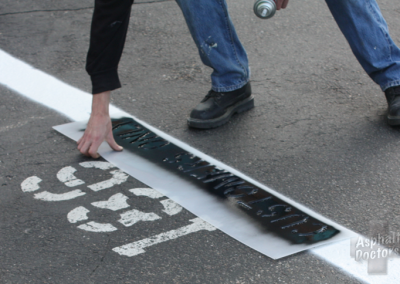 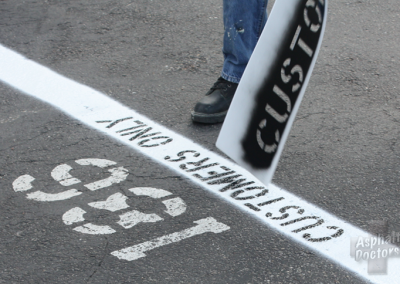 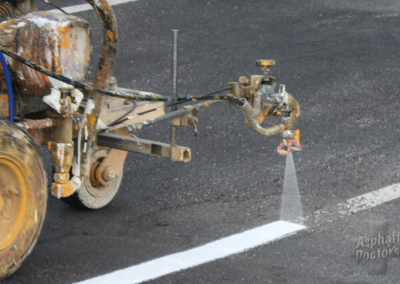 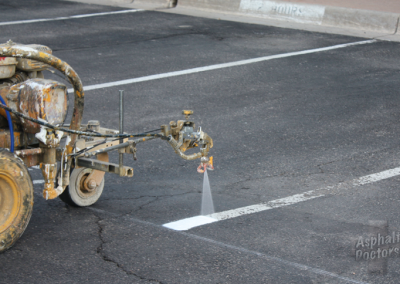 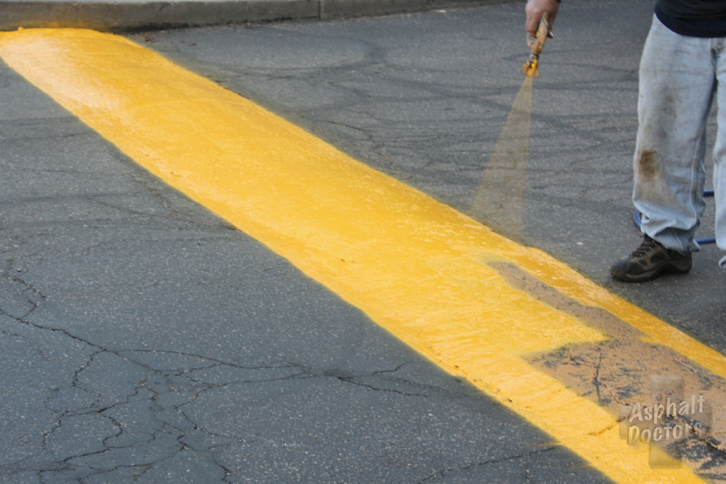 To help preserve or improve the flow of traffic on a parking lot, Asphalt Doctors parking lot stripers will either re-stripe or lay out new markings per customer’s blueprints or our design. 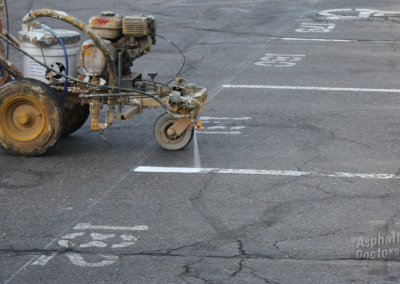 A property owner aims to get the most cars possible into a parking lot to maintain cost-effectiveness. 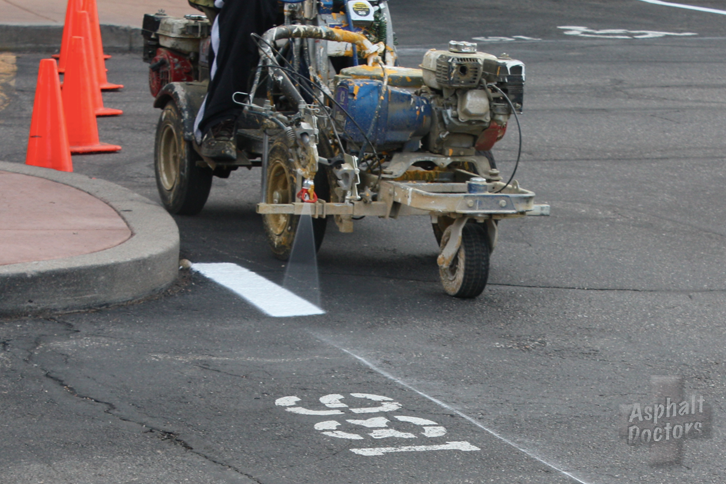 The right layout and parking lot striping can help meet this goal. 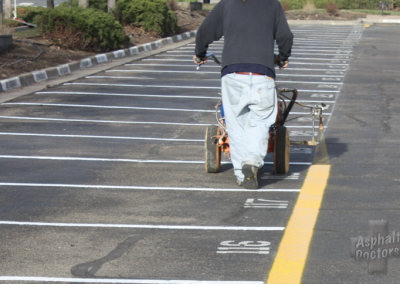 Customers want parking lots that allow them to enter, park, and exit quickly and safely. 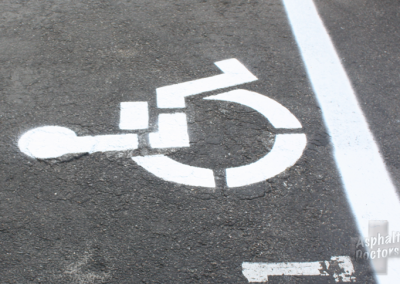 Attractive and properly placed parking stalls, arrows, and handicapped-reserve signs help to efficiently direct travelers. 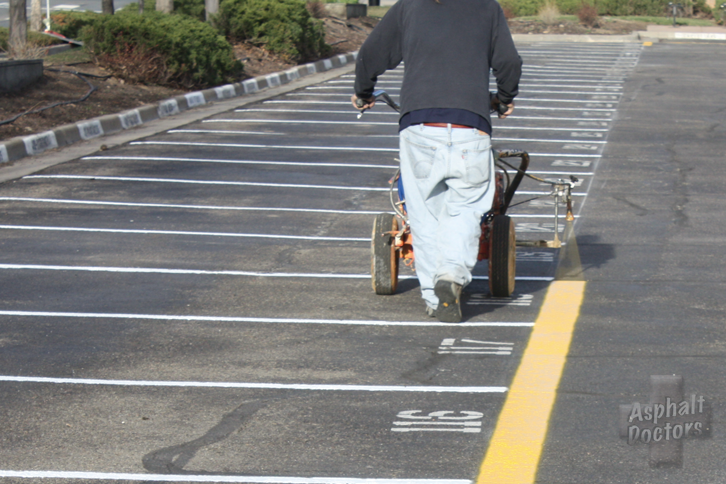 Before parking lot striping, it important to consider whether a parking lot needs designated parking spaces for disabled persons, customers, employees, visitors, or other individuals. 100% acrylic low solids water borne traffic & parking lot paint formulated to meet or exceed the performance requirements of Federal Specification TTP- 1952B. 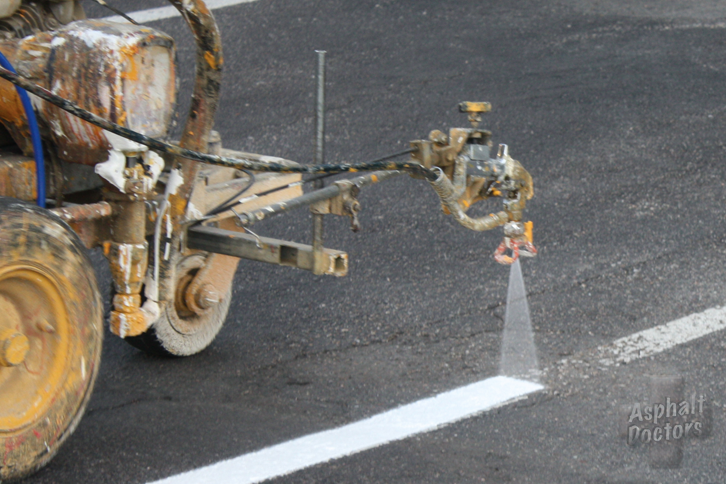 This product line offers good durability and bead retention. 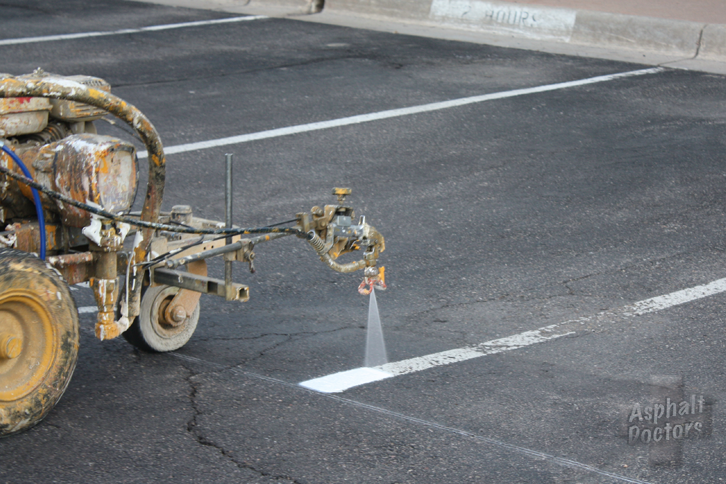 Area to be striped will be swept clean and blown clean for proper adhesion. 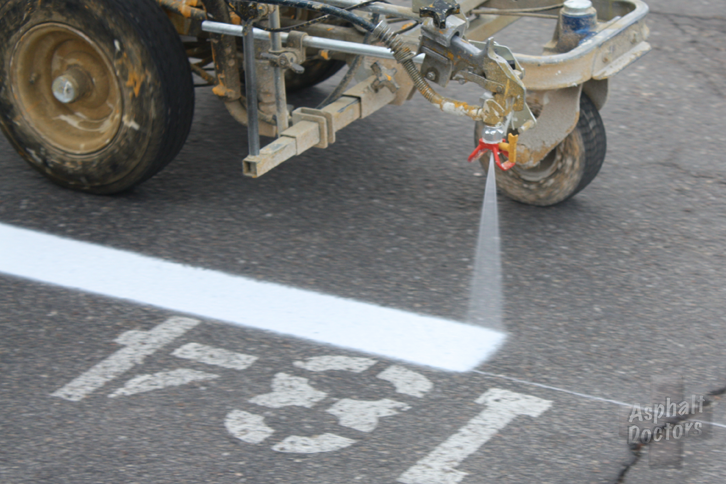 Striping will be applied using a walk behind striping machine to ensure crisp straight lines. 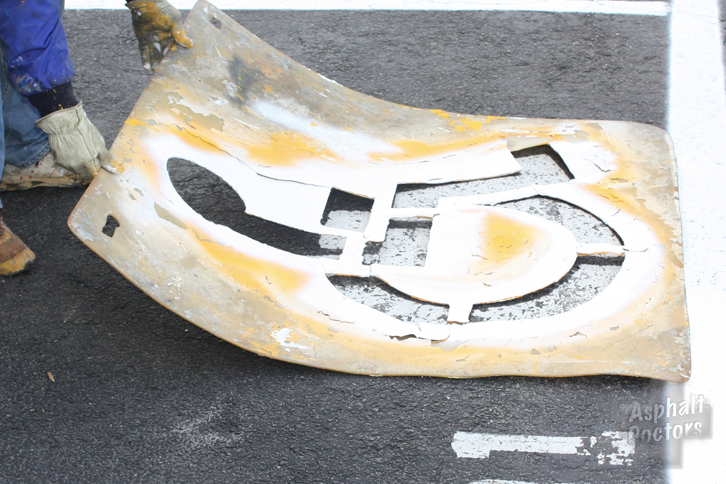 Stenciling will be masked with plastic stencils and sprayed on by machine. 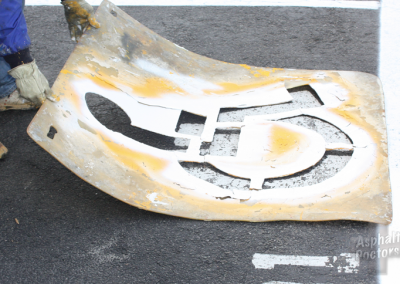 Any debris resulting from this process will be removed. Your information will not be sold or used for anything other than Asphalt Doctors related communication.